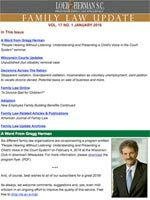 You will receive an e-mail shortly asking you to confirm your subscription to Family Law Update. Simply click on the link provided and we will add you to our subscriber database. You will begin receiving issues on the first of each month.